Organic Ham certified from Finca Montefrío, near Jabugo. Iberian ham pure 100% breed. Excellent organic ham from Jabugo denomination. Iberian Bellota Ham from farm Montefrío. 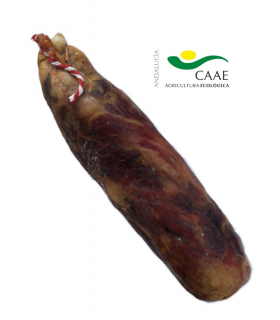 An exceptional ham, made from 100% Iberian pig breed, fed only organic food. This farm is managed by a couple of producers who breed native Iberian pigs, thus preserving the purity of the breed. They take care of it along its growth through a wide, strict and organic food. The property is situated in fact on an authentic ecosystem that allows a varied diet throughout the year. The turning point takes place from October to February when the oaks (untreated trees holm oaks and cork tree mainly) provide the acorn, from which the pigs on the farm feed exclusively. Of these pigs derived hams (quality Summum) with a very particular taste. In 2014, since the change of labels (Decree of the Ministry of Agriculture nationally) have obtained the black label: 100% Iberian pig breed, the best that existing in Spain: "Pata Negra".